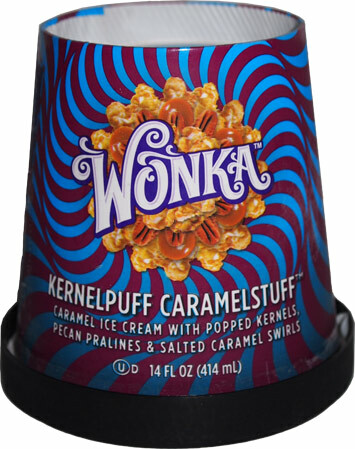 [New for 2012, retired April 2013] Ok, so you remember how Wonka released 7 new flavors and was nice enough to send them all of for testing. Well, there are still two left and it's about time we dug in. 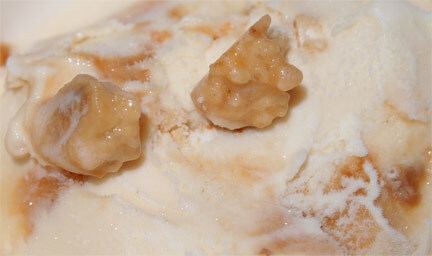 I know what you are thinking, that sounds alot like Caramel Nut Kadoozle. Well, you're right. 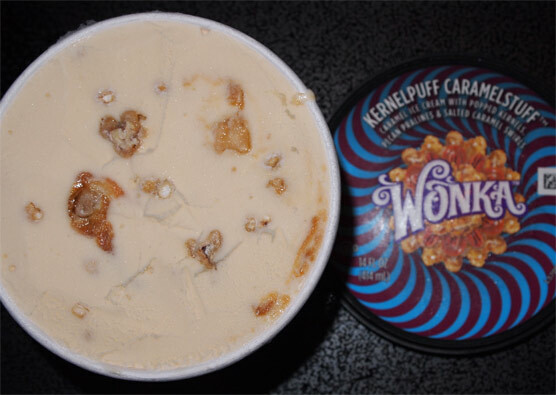 Both have a caramel base, both have a caramel swirl (walnut caramel vs salted caramel), and both have a wonky mix in (mixed nut brittle vs popped kernels & pecan pralines). So they are definitely similar, but remember that Kadoozle is pretty much my favorite flavor of the bunch so far, so I have high hopes for this one. So, does this bad boy have your attention yet? Maybe we need to zoom in on those chunks. Now does it have your attention? What's the old phrase, "better to go out with a thud than a whimper"? I'm pretty sure I'm paraphrasing or just completing messing that up, but it does describe how this ice cream rolls, or should I say thuds. The bits you see before you are immensely crunchy. I can't even think of anything that's as solid. It's as if you made a hard sourdough pretzel out of sugar, and then tried to bite it. Various companies have dabbled with hard sugary bits before, but these take the cake by a mile and a half. You know something is hard when you go to scoop and the chunk physically prevents your spoon from going any further. I suspect some might think this crunch is overkill and borderline dangerous (I know I have in the past), but boy does it work here. These little buggers are just so much darn fun to crunch, it's crazy. 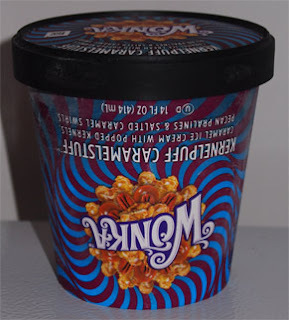 Every Wonka flavor has a gimmick, and they are them. I don't even know if these are suppose to be the kernels or the pecans or both, I just know they are cold, sugary, and adding a neat little kick to my night. Do I love this ice cream right off the bat? Yeah, pretty much. It took all of my will power to only eat half the container... ok, I may have eaten the big half of the container. It's summer, it's hot, and this one is exquisite. I like the base, I like the intermittent swirl, and I like the overall flavor that's got a toffee vibe to it. 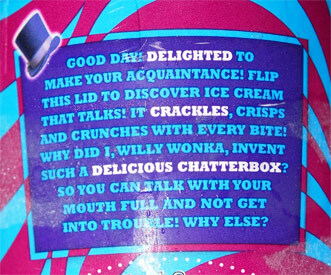 Oh, and I love the crunch ofcourse. Oh the crunch that seems to be in almost every bite. Good times. On Second Scoop: Oh I like this one. Granted I like Heath Bars and Crunch n' Munch, so I'm pretty biased, but it's just neat to find flavor like this in a pint (well, faux pint). It reminds me of walking down the boardwalk while sharing a big fresh container of caramel popcorn with one of my parents, except there's almost a hint of smoke or coffee to it. Not literally, but just a little bit of lingering something that gives this one a little bite to it. This is the Bonaroo Buzz for all the people that don't like Bonaroo Buzz.... it was hard, but I just shared the last few bites with my wife. I didn't want to, but it was the right think to do (hehehehe, oh, just teasing). She's chiming in with a big endorsement and saying it reminds her of crackerjacks. Ofcourse, now we're both sad that it's gone. Goodbye my little friend, we will miss you. oh wow. This looks really good - I also just happen to really like Pralines. Great review!